After shooting a video with your Android smartphone or tablet, you may need to edit it for better quality and make it more fantastic before uploading to YouTube or posting them on Facebook. If you are using Final Cut Pro, you may encounter some obstacles when importing Android videos for further editing, like "unsupported video files". How to edit Android video in Final Cut Pro successfully? Well, in this article, we will introduce an efficient way to fix the incompatibility issues between Android videos and FCP. Why Failed to Import Android Video into Final Cut Pro? Although Final Cut Pro tries to be helpful by automatically changing the sequence settings to match the clip you throw to it, things don’t work out so well when it comes to Android videos. Actually, the video you shot by your Android phone or tablet mostly is 3gp or mp4 format video, which may contains a video codec incompatible with Final Cut Pro. To solve this dilemma, you need to take a little up front time and set up a workflow that will convert your Android video into FCP edit-friendly format and codec. 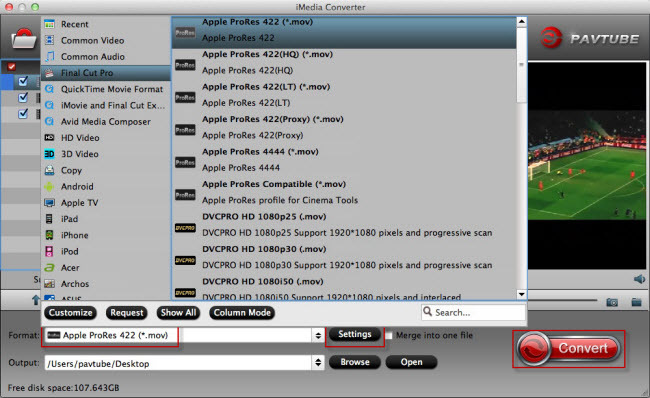 For this case, Pavtube iMedia Converter for Mac/Windows is the bee’s knees. This video coonverting tool can effortlessly convert Android videos to Final Cut Pro best friendly-editable video format such as ProRes MOV with with the best quality. What’s more, it also allows you to convert any digital videos, including MKV, AVI, FLV,WMV, etc. to Final Cut Pro, even Blu-ray and DVD can be used as source media files to rip to FCP for further editing. Besides FCP, it also offers optimized codecs for other NLEs, including DNxHD for Avid, MPEG-2 for Premiere, AIC for iMovie and more. Here is the review. Now download the software on mac and follow the guide below to start conversion. Run the best Android video Converter on Mac and click "Add videos" button to load your videos for conversion. Note: Batch conversion is supported, so you can load more than one Android videos to save time. You can also check the “Merge into one” box to join several files together. Click “Format” drop-down bar to select a proper video format. For editing Android videos in Final Cut Pro, "Final Cut Pro" > "Apple ProRes 422(*.mov)” is the most suitable editing format. Audio Settings: Generally, audio only has ‘Surround’ or ‘Stereo’, and the maximum audio bit depth isn’t specified. Sequenced audio is always mixed using 32-bit floating-point values. Simply click the “Convert” button to start Android video to Final Cut Pro conversion and everything else will be automated. 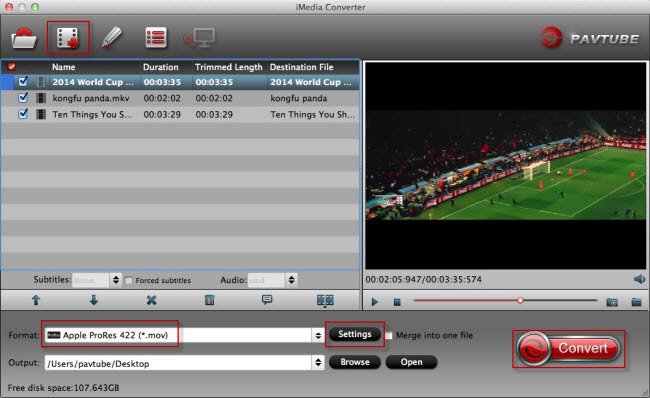 After the conversion, you can click “Open output folder” button to get the resulted videos effortlessly. Now, it’s much easier for you to import Android video to Final Cut Pro for smooth editing.